We’ve got another progress update for you, on pod2g’s untethered iOS 5.1.1 jailbreak. Pod2g posted on Twitter today, that they have found a “way through”, to make this new jailbreak work on the iPhone 3GS and iPod Touch 3G. His “way through” was not explained, but he said he’ll have more on that later. 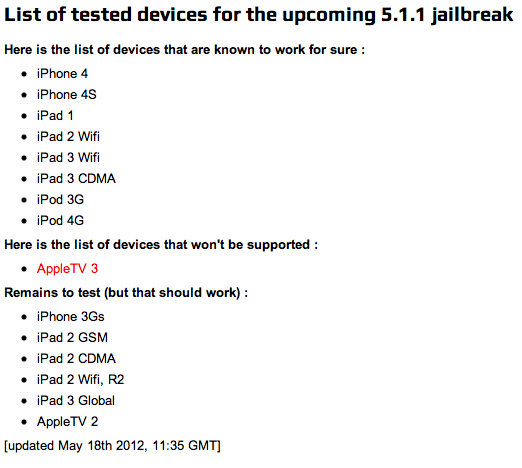 iPhone 3GS and iPod 3G can already (and will always) be jailbroken untethered, thanks to geohot’s limera1n exploit. The iPhone Dev Team incorporates this in Redsn0w. Maybe this is how pod2g and The Chronic Dev Team have achieved the iPhone 3GS and iPod Touch 3G support with their latest tool, but that it just speculation, on my part. Pod2g’s newest jailbreak is expected to be released before the end of May, with speculation that it could be introduced at this this year’s HITB SecConf, which takes place May 21st to the 25th.